The Century has not so far been kind to those Canadians pining reminiscent for the days the country was a liberal democracy; run by relatively responsible actors on the world stage, the brokers of peace, guarantors of civility and fair governance in a dangerous, chaotic world. To be fair to the successors of Brian Mulroney, the prime minister who hitched the nation's wagon to America's seemingly forever rising star through the Free Trade Agreement (FTA), destiny dealt them a crummy hand; but both the Jean Chretien and Paul Martin administrations went beyond the investment oriented FTA (later to morph, with the inclusion of Mexico, into the tripartite NAFTA agreement) "committing" Canada to both America's foreign policy objectives, and the military methods it employs to achieve them. 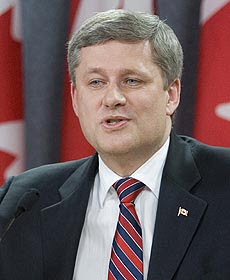 While more extreme than his predecessors, Stephen Harper's administration has merely accelerated the process begun by Mulroney, and furthered by the Liberal party, a process that has most dramatically manifested in the deaths of at least seventy-eight Canadian soldiers in Afghanistan, and the killing and maiming and imprisoning of uncounted numbers of Afghanis. Harper recently proposed legislation in Parliament to extend the country's entanglement in Afghanistan in the form of promises made to NATO to continue past the already extended exit schedule of February 2009 through to the end of 2011. He did this with the complicity of the federal Liberals, whose support his minority government had to have. The fact the majority of Canadians opposed Canada's involvement in what was ostensibly America's revenge for the 9/11 attacks, (based on the untried assumption Osama bin Laden planned and orchestrated the storied operation from his cave hideout in Afghanistan) before the launch of 'Operation Enduring Freedom' carried no freight with Jean Chretien's administration, just as majority opposition to the country's continued involvement means nothing to the current Harper regime. Canadians will continue to follow U.S. diktats in Afghanistan, and both Canadians and Afghanis will continue to pay the price for Ottawa's acquiescence. The surrender of sovereign foreign policy is not limited to Afghanistan: Canada under Harper was first to express support for Israel's embargo against the rightfully elected Hamas government in Palestine, and uttered nary a word of protest against Israel's brutal and illegal bombing campaign over Lebanon in 2006. This support came even as one of the last Canadian peacekeepers attached to the United Nations was deliberately murdered, (with three colleagues) by the Israeli Defense Force (IDF) while at his U.N. observation post in southern Lebanon. Harper too had nothing to say about a Canadian family of seven murdered by a missile as they attempted to flee the Lebanon blitzkrieg in their car. On that occassion, Harper's team thought it more pertinent to question why the Lebanese-Canadians were visiting what was about to become a warzone, rather than demanding the IDF cease its killing spree, at least until the thousands of Canadians known to be in harm's way had a chance to evacuate. If the official Canadian silence on Israel's serial war crimes in Palestine, crimes that translate as a measured, systematic genocide, were not dutiful enough for America and her racist client/colony in the Middle East, Stephen Harper's Conservatives too take pride of place, being among America's first and most eager accomplices in its self-proclaimed War on Terror, an essentially open-ended declaration of war on any and all standing between America and her perceived "vital interests." The Canada/U.S. cooperation under arms is an arrangement about to get cosier in Afghanistan, where Canada's demand for a thousand more soldiers is being answered in part by France, which is expected to send as many as 700 more soldiers to relieve American forces operating in the east, enabling then a redeployment of those American soldiers to enjoin the battle at the heart of the resistance to the foreign occupation in southern Afghanistan, beside Canadian Forces. Harper has proven the perfect pupil for neo-con Washington so far, but a breaking story, predictably suffixed in the press, 'NAFTA-gate' highlights his first failure in his masters' eyes. In the hours before the much vaunted Clinton-Obama primaries in Ohio and Texas earlier this week, a whisp of scandal wafted south of the forty-ninth. Apparently the war of words between the candidates, each claiming to audiences in delegate-rich, rust-belt Ohio to hate the NAFTA agreement more than the other, is nothing but a con. Agents for both camps had tipped nervous Canadian officials, telling them the NAFTA rhetoric was just that, and reassuring the deal was in safe hands. Curiously, it was only the second revelation of Democrat duplicity, that of 'front-runner' Obama, that hit the airwaves. Now, Harper is being pilloried in the U.S. media, dragging down with him the reputation of the Prime Minister's office, and as Toronto Star columnist, Chantal Hebert pointed out on tonight's C.B.C. television broadcast of 'The National,' the administration's loose lips could also sink Canada's foreign services. Hebert wonders if the Obama-embarrassing revelations would raise doubts in the minds of others who might otherwise confide in Canadian agents, trusting their information would not lead the next evening newscast, either by political design or through incompetence. This she argues could make their efforts extremely difficult and disadvantage the country. It would be ironic if Stephen Harper, accomplished Canadian boot-lick, found himself on the wrong side of history; caught wrong-footed as the new political reality of an Obama presidency dawns. But perhaps Hillary would smile upon her unwitting servant, who already granted one great service in a tight race needing winning. A second President Clinton would also continue Canada's newly understood role at America's side, as enacted by Harper, no doubt extending "The Mission" in Afghanistan still further, and assimilating the rest of Canada's military, law enforcement, and political infrastructure. It will doubtless make for an awkward moment for Stephen Harper, should President Barak Obama come to call. That is assuming Harper has a year left in his rule. The Chuck Cadman affair is not going away. In that lurid case, Harper emissaries offer death bed conversion to the terminally ill independent MP Cadman in exchange for a vote in the House that could bring down the erstwhile Liberals of Paul Martin. The operatives are said to have offered an insurance policy arrangement allegedly worth up to a million dollars for Cadman's widow, (herself now the official candidate for Harper's conservatives in her late husband's riding). Though a recording of Stephen Harper admitting he knew beforehand of the plan to make the offer to Cadman, an offer the Liberals insist is a bribe, has aired nationwide. Harper does not admit to either authoring, or authorizing the plan. He does however admit to knowing about, and doing nothing to stop the plan - an illegal plan, if the Liberals are proved correct. That makes Mr. Harper guilty of conspiracy to bribe a public official. Considering the seriousness of the charge, and the dogged grip with which the opposition has taken up the allegation, (Liberal heavy, former hockey star, Ken Dryden going so far as repeating his charge against Harper for the cameras word for word outside House of Commons' slander protections) the Cadman affair could well bring on the election Harper has been spoiling for. Should Harper and his Republican-like Tories survive the year, or be replaced by the equally servile Liberal party, Canada in 2009 will resemble nothing more than it does today: A rump-nation, pulled along by a shortening leash, made to devote its blood and treasure in the service of a tyrannical master; a nation made to savage the rights and freedoms at home it purportedly fights wars to instill abroad. This is not the Canada I remember. This is not the Canada any Canadian can remember. Back in the sixties, when the citizens of Alabama wanted to get a fair report on the progress of the Civil Rights movement in their state, they had to turn to the national media, and especially the network news, to get it. The local print and broadcast media would either grossly distort what was going on, or, more likely, they would simply report nothing. In a sense those days are back. There are a handful of independent papers in the state, but the three Advance newspapers published in the state’s major urban areas, operate to the historical tradition of their most shameful moment. The big offenders, as I have chronicled repeatedly, are the Birmingham News and the Mobile Press-Register. If a special prosecutor is appointed to examine the gross irregularities surrounding the Siegelman case—and calls for that step mount with each passing day—then the inexplicably cozy relationship between the two papers in Birmingham and Mobile and the politically directed prosecutors who pushed the case against Siegelman should be right near the top of the matters investigated. It reflects a press that masquerades as independent and objective while it takes up a partisan sword in a particularly vicious style, slashing away at the roots of civil society. The third paper, the Huntsville Times is regularily held up as something more akin to a newspaper, standing on legs of its own. It’s certainly not as bad as the other two. But the best that can be said is that this paper is slumbering through one of the more important crises in the state’s history, with an attitude of self-satisfied and arrogant indifference. Just take a look at this editorial published yesterday morning. It’s an amazing demonstration of intellectual torpor. The saga of former Alabama Gov. Don Siegelman continues. So does Siegelman’s incarceration in a federal prison. If nothing else, the lingering controversy over Siegelman’s trial, conviction and sentence has at least brought public interest to the kind of federal criminal procedures that rarely stir much passion. On Tuesday, Michael Copps, a member of the Federal Communications Commission, asked for an investigation into the TV broadcast blackout that kept Huntsville viewers from watching most of a CBS “60 Minutes” report on Siegelman Feb. 24. The local CBS affiliate, WHNT-TV, Channel 19, says the problem was technical and had nothing to do with the content. Skeptics smell a political motive, but if Channel 19 were trying to suppress the report, which seems unlikely, it brought more attention to it than would have occurred otherwise. WHNT broadcast the entire Siegelman segment later that night and again on its 6 p.m. newscast the next day and posted the video on its Web site. That’s a lot of Don. The timing of the technical problem was unfortunate, but there is no evidence to support the claims by some viewers that the blackout was intentional. The attitude of visceral contempt towards Siegelman that is typical of the Republican-leaning Alabama media is clear right from the outset. Whereas papers and broadcasters across the country focused on the blackout at WHNT and discussed it—led by the New York Times which made it the subject of two articles and an editorial—the Huntsville Times initially dealt with this national headline grabber on its home turf by reproducing the official statement issued by the station’s management, full stop. Now that’s what we call aggressive journalism! The editorial claims “there is no evidence to support the claims… that the blackout was intentional.” But the initial justification given by WHNT for the blackout was false, and was not corrected until they were caught in the misrepresentation. And the editorial writer does not find it even remotely curious that only one segment of the 60 Minutes program was blocked—the Siegelman segment? Now my, that’s quite a coincidence. It’s just the sort of coincidence that was commonplace back in the Civil Rights era. And my recollection is that back in those days, the Times had just the same take: it’s just a coincidence. Indeed, the appeal to the 11th Circuit Court of Appeals should have been filed before now, but it wasn’t because the original court reporter died after the trial, and preparing the transcript, needed for the appeal, has taken longer than normal. Same pattern here: whatever lame excuse offered up is accepted as plenty good for this editorial writer. Why take a second to examine the assertions? Might he, for instance, confer with a court reporting service about the average time it would take a professional court reporter to transcribe the record? He would have heard, as I did, “two to three weeks.” So why did this take over 14 months? Of course, it’s impolite to ask such questions. It’s also impolite to note who had responsibility for having the record completed on time. His name is Judge Mark Fuller. Again, events have proven unfortunate for Siegelman, but no one has suggested the court reporter died on purpose to keep Siegelman behind bars. Indeed, no one does suggest that the court reporter’s death was to “keep Siegelman behind bars.” What is not just suggested, but is completely clear, is that this is a pathetic excuse cited for just that purpose. The deceased court reporter is not responsible for the delay. The judge’s failure to have the record prepared is. The judge cynically concluded that mention of the misfortune that befell his court reporter would end all queries. And if the world consisted only of the terminally incurious sorts who write pieces like this one, it would. Yes, it may have been unusual for a defendant of Siegelman’s stature to be refused bond during his appeal, but it is not entirely unheard of. On Monday, international media mogul Conrad Black began serving time in Florida after being convicted of fraud. Like Siegelman, Black will be in federal prison while his appeal is pending. Like Siegelman, he was also convicted of obstruction of justice, a charge which may have resulted in both men receiving similar treatment. But Black was at least given a few days before reporting to prison. Siegelman was whisked from the courtroom after surrendering his belt and shoes. Black is a member of Great Britain’s House of Lords and holds the title of Lord Black of Crossharbour. Maybe that made a difference. So the editorial writer actually believes that a foreign aristocrat is entitled to different–superior–legal protection from a citizen who served in public office for over a decade and has deep connections to the community. Of course the legal standard is the opposite. A person without roots in the community, for instance, a foreign resident, is considered a flight-risk and is less likely to receive freedom pending appeal. Hard to believe this gets written, and even more amazing that a newspaper publishes it. Ahh, but this is written by one of the editors. As for Siegelman, it’s hard to avoid two observations. One is that federal prosecutors pursued the case with an unusual degree of fervor. But this also seems true: Don Siegelman did what he was accused of doing, the illegality of which may remain in question but the ethical standards of which leave a lot to be desired. So here’s the crux of it. The writer also couldn’t be bothered to actually watch 60 Minutes, or even read a summary of what it reported. He’s completely satisfied with his own thoroughly misinformed prejudices (that’s what editorial writers are paid for, isn’t it?) But that won’t stop him from writing about what he hasn’t seen. Had he watched the segment, he would have seen that the 60 Minutes investigators, and 52 former state attorneys general, found that there was no credible evidence that Siegelman “did what he was accused of doing.” Or more particularly, the evidence offered was false, and was or should have been known to the prosecutors to be false. The editorial writer also has never taken note of the decision issued by a federal judge in Birmingham, who reviewed sworn allegations respecting the misconduct of the Siegelman prosecutors and found them “extremely troubling,” and said that they raised a “prima facie case of impermissible conduct” by the prosecution. That actually had to do with precisely the same false evidence that was the focus of the 60 Minutes segment. Of course, that’s just another coincidence. Aren’t they multiplying? But then of course, I forget, this is an Advance newspaper, and none of the Advance newspapers ever reported on that published opinion. They treated it the way they treated demonstrations in the mid-sixties: they just didn’t happen. Moreover, the prosecutors suppressed exculpatory evidence which would have rendered the testimony of their principal witness unbelievable. All of this does indeed raise very profound questions about ethical standards—of the prosecutors, and the lapdog press. Americans deserve less partisanship in their federal court system and Justice Department, and Alabamians deserve more upright conduct from their elected officials. And even more urgently, Alabamians need genuine newspapers. None of the three Alabama markets served by Advance has one.